When it comes to our health, our hormones play a much more significant role than we may assume. Our hormones are responsible for communicating messages from the brain throughout the body; when that connection is working well, we feel more emotionally stable and vital, and our bodily systems run smoothly. When there’s an error in communication though, our body (and mind) suffers. We might recognise it in the form of anxiety, unexpected weight gain or weight loss, depression, or just knowing we’re not feeling as happy and healthy as we could feel. Our glands secrete hormones, and all glands are are important for maintaining our health – but one of the largest and most important happens to be the thyroid gland, located at the front of the neck below the voice box. 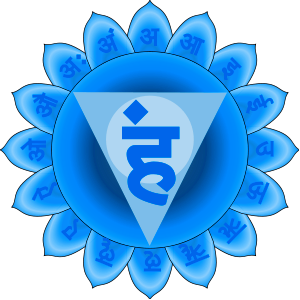 This gland is connected to the vishuddhi chakra (the throat chakra), which is the energy center for purification, speech, sound, communication, self expression, creativity, an ability to listen to others, and the ability to speak our truth. In a physiological sense, our thyroid gland governs our energy levels, metabolism, helps to stimulate the heart muscle contraction, maintenance of the nervous system, brain development, and keeps our levels of calcium in check. Just as with the chakra system, when a part of our hormonal system is out of balance, we experience very physical symptoms. When the thyroid is out of balance, we either experience hyperthyroidism (when the thyroid produces way too many hormones), or hypothyroidism (a case in which the thyroid isn’t producing as much as we need). Hyperthyroidism results in unexpected weight loss, a sudden increase in appetite, rapid heartbeat or heart palpitations, increased sweating, anxiety, irritability, consistent fatigue and muscular weakness and difficulty sleeping. In modern-day hectic life, it doesn’t take much to set us off balance, and hyperthyroidism can occur especially if we’re faced with a stressful work life or relationships, or if we’re just not getting enough nutrients and balancing our rest and exercise levels. Hypothyroidism – where the thyroid gland begins to slow down and ceases working so well – causes fatigue, a decrease in cognitive function (i.e. you’re becoming more and more forgetful…), lethargy, depression, constipation, an increased sensitivity to temperature changes, unexpected weight gain, swollen joints, and muscular weakness. If we take a look at the symptoms of an imbalanced vishuddhi chakra, we can see that a deficiency results in illnesses linked to the throat – such as colds, flu or nodules, as well as shoulder and neck tension; fear of expressing ourselves, fear of speaking in public, anxiety, low mood, a ‘weak’ voice and shyness. Conversely, an over active vishuddhi chakra results in an inability to listen to others’ points of view, gossiping, lying, talking over others and interrupting, a ‘need’ to show off intellectually. What these two different aspects have in common though, is the fact that an imbalance in the vishuddhi chakra causes problems with the thyroid. These physical and emotional symptoms don’t all appear over night – it’s usually a case of feeling a little more fatigued each day, a reliance on those stimulants like coffee, energy drinks and sugar, and a reduction in that feeling of vitality, happiness and health we each have the right to feel. If you feel even a few of these symptoms, it’s worth experimenting a little, as making a few simple changes really can lead to big changes health-wise. Iodine is very strongly linked to the efficiency and strength of the thyroid gland, so up your intake of foods such as seaweed (nori, dulce, arame and kelp all contain high levels of iodine and can be bought from most healthy stores as sheets to wrap sushi in, or as a sprinkle to use over meals), black walnuts and Irish moss. Foods high in vitamin A such as carrots, sweet potato, kale, squash, dried apricots, melon and sweet red peppers can help to activate the thyroid, as can zinc-rich foods such as nuts, spinach, wheat germ, seeds, raw cacao, mung beans and mushrooms. Don’t avoid fats – just make sure you’re consuming the right ones…. Coconut oil, avocado, nuts and flax are best. Lastly, increase proteins such as quinoa, beans, eggs (for non vegans), nuts, and nut butters, and good quality soya. Sugar, refined carbohydrates, white flour, and peaches & pears – which can decrease the thyroid’s production of thyroxin. Cut out gluten, as this is something which increases the severity of hypothyroidism. Running, dancing, yoga, swimming, and anything else that gets you moving and the blood circulating again will help boost oxygen throughout the cells and to rid the body of toxins. We know our thoughts are extremely powerful – and keeping positive can make a big difference in the way we feel and the time it takes for the body to heal and come back in to balance. Protein is also crucial for maintaining long term energy and a healthy body – it’ll also give you the boost you need to move, dance, run, breathe and generally feel good. Calming herbal teas such as chamomile, lavender, echinacea and lemon balm are also useful for calming the body and mind. Decrease your intake of vitamin A rich foods, just like the ones those with hypothyroidism should increase. It’s also majorly important to avoid refined sugars and carbohydrates, and white flour. Cut down on stimulants – so coffee, caffeinated tea, sugar and energy drinks are all best avoided if you’re looking to heal anxiety, fatigue and heart palpitations especially. Strengthening, slower paced exercise is best for helping out with an over – active thyroid. Yoga, swimming, strength training done at a mindful pace, and walking in nature are all especially effective. Even something as simple as connecting to the breath for a period of time each day can help to calm anxiety and over activity in the body, and help to bring things back in to balance. And of course, stay happy! Finding your voice, creativity, truth and expression again…. So now you know…. If there’s anyone you think might find this knowledge useful – share it with them and pass on the positivity!